Are you like me and have a drawer full of cute sticky notes that you forget to use because they aren't conveniently placed where you work? I know I always forget I even have them, so I decided to do something about that. I experimented with some plain computer paper to come up with a pattern before trying to make some out of some pretty scrapbook paper. Below is what I came up with. Unfortunately, I did not write down any measurements for this project, but I can tell you that I used my paper trimmer and Martha Stewart scoreboard. lol I found that regular scrapbook tape wasn't going to be strong enough to hold these containers/boxes together after scoring and folding, so I had to get out my red sticky tape. That did the trick just fine. 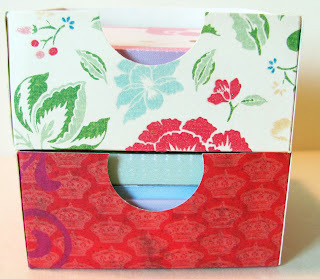 Then I used my circle punch to cut half circles out of the front of each box. I think I went down a bit too far when punching out the circle on the bottom box, but I can live with that. I'm also thinking that I used a 6 x 6 square of paper, and then scored each side at the 3" mark, but I honestly can't be sure. I do plan to make another box for the sticky notes I just bought the other day, so I'll make sure to make note of the measurements and share them the next time around. lol One good thing about these boxes is you can stack them on top of each other, so they don't take up much room on your desk. Love it. Thanks for stopping by to visit with me today. Leave a comment please. Happy dollie playing and crafting. Birdhouse and Recycling. Win Win! I have a thing for repurposing things along with really cute birdhouses. I really haven't seen too many birdhouses that I didn't like. lol Anyway.....I usually find my birdhouse to make over at a craft store or a thrift store. The below birdhouse was unfinished, but not I have repurposed some junk mail ads to help decorate this cute birdhouse. At least I think it's cute! lol I hope you do too. In the first picture you can see that I quilled some flowers out of some junk mail ads that I put through the shredder. I often shred junk mail to use in my Ebay packages rather than buy peanuts, etc. Works great! 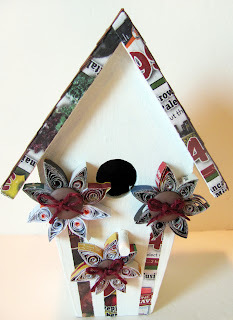 I used ordinary tacky glue to glue the flowers,buttons, and paper strips on the birdhouse. 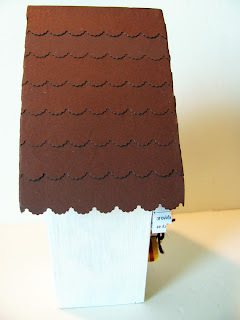 For the roof I used brown cardstock cut and trimmed to size, and I used an EK Success punch to make the scallops on each strip of paper. I really love how this birdhouse turned out. I know the petals aren't necessarily uniform in size, but there are no mistakes in crafting, so it's all good. I'm keeping this birdhouse displayed in my office/craft room because it makes me smile. Oh....I almost forgot to share that I painted the birdhouse first with white acrylic paint. I hope you like it. Hey dolls and crafters. Well...I've been mia for awhile now again, so I guess I'm just not going to be a good blogger. No excuses....just life gets in the way. I have been busy though, and I promise I've been playing with my dolls and crafting. So....I have 3 posts for you today, and I hope you enjoy. The first post is about a project I've been working on for a long time. Finally, it is just about complete. I don't know why it's taken me so long to get this far. 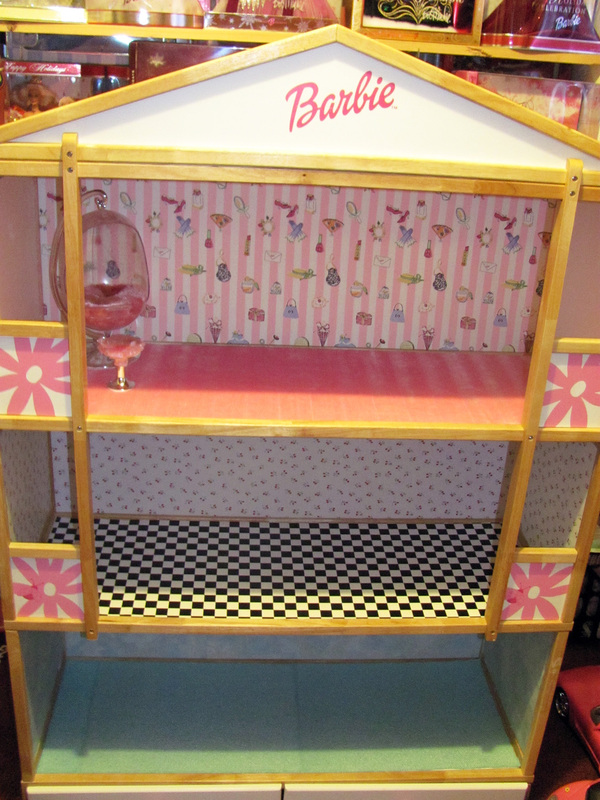 So...here is a preliminary picture of my Barbie doll house almost completely finished. All I have to do is finish the 2 bedroom walls, move some furniture and decor items in, and then let some of my doll start living in it. Hopefully it won't take me so long to share pics of some of my girls living and enjoying their newly decorated home. We'll see, because I do have plans to make some decor items and repaint some others. Here are some of the steps my hubby and I took to revamp this dolls house. The original floors were warped, and furniture would not sit right in any of the rooms. Lamps, etc. would fall over, so something had to be done. I decided to use foamcore board for new flooring, so I had to cut that to size to fit right on top of the existing flooring. Then I had to decide what I wanted to use to cover the new floors, and that took a bit of time. The bottom floor is covered in cut up placemats that I thought looked like carpet. The 2nd floor is covered in black and white checked contact paper. The 3rd floor is covered with rayon pink velveteen fabric to mimic pink carpeting. I recovered the walls with wrapping paper and contact paper. All of this was done while the house was taken apart for easier measuring, cutting, and installing. I had to cut some foamcore board pieces to cover with the right material for the side walls. I used red sticky tape to hold those side pieces in place. I still need to cover the 2 white bedroom pieces with some pale blue paper, but that will be done soon. 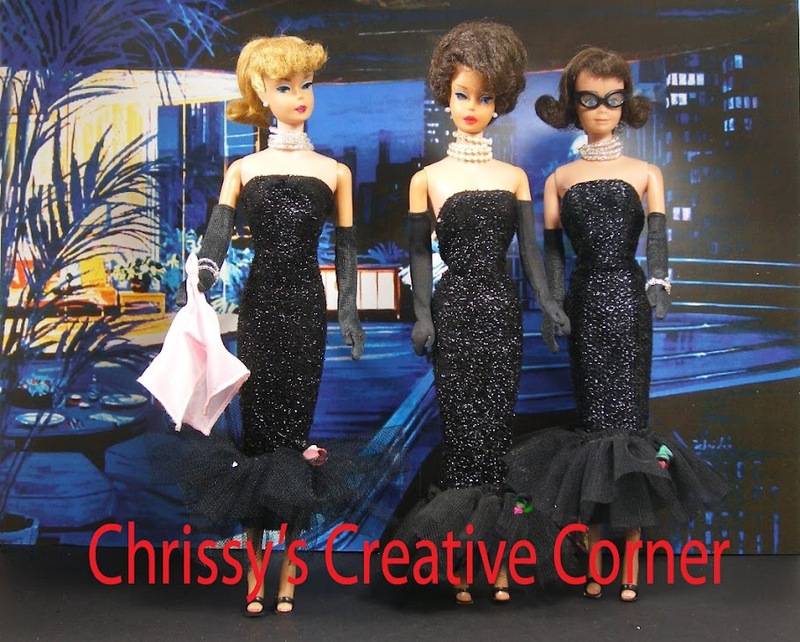 Then the decorating can begin, and some of my dolls can start living inside. I can't wait to finally have this done. 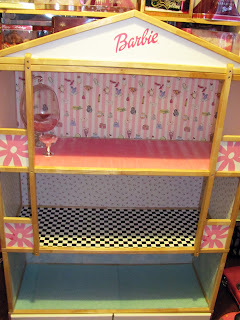 Oh....and of course hubby and I had to put the doll house back together and return it to the Barbie room. I hope you like what I've done so far, and I will be sharing more pics once some of my dolls have moved in. Happy dollie playing and crafting!